At Amore of Wayne, you’ll find a unique casual-dining experience featuring the finest Italian cuisine as well as contemporary selections including premium steak. In addition, we’re proud to host your friends and family for private parties and special events, or bring the great food of Amore of Wayne home with numerous off-site catering options. Conveniently situated one mile from Route 23, our location also features the Greenhouse Bar and Grill, our on-site and full-service drinking and dining tavern. Our special event menu for Easter is now available! Remember to make a reservation to join us this holiday weekend. 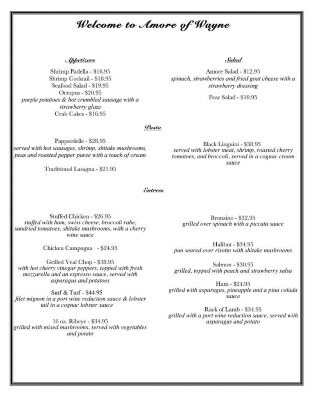 (1) Find your favorite entrée on our Dinner Menu. (2) Give us a call at 973-595-7717 and place your order. *OR* Email your order and pick it up for lunch or on your way home for dinner! (3) We’ll let you know when to come by and pick it up! We at Amore of Wayne are happy to be the new meeting location for the Wayne Rotary Club! The Wayne Rotary Club meets every Wednesday from 12:15 PM to 1:30 PM. All are welcome! Find our more on the Wayne Rotary Club Facebook page! Do I Need to Dress Up / Is There a Dress Code? No! Although we pride ourselves on our upscale ambiance, we provide a casual dining experience for all of our guests. Yes! In addition to our full service bar downstairs, the Greenhouse Bar and Grill, we have a wide selection of wines available. Please check our Dinner Menu for more information. Yes! We take reservations for parties of 3 or more. Please use our Reservation page to reserve your table. Yes! We have our own off-street, private parking lot with space for more than 80 vehicles. Browse our site for more information, including Menus, Catering options, Party planning, Photo Gallery, Contact form and more!